Children under 12 and Scouts in uniform are free of charge. The 2018 edition of the Dayton Artistry in Wood Show continued its tradition of hosting the premier woodcarving and woodworking show. Beginning in 1981 and in its fourth home at Roberts Centre, Wilmington, OH the 2018 show continued to amaze visitors and exhibitors with the outstanding quality of art in wood. The beautiful ballroom of Roberts Centre hosted 245 exhibition spaces with 155 exhibitors and 20 vendors filling those spaces. 3400 visitors explored the attractive 15 aisles and outer walls of exhibition spaces in the well-lighted and magically appointed atmosphere of the ballroom. At the center of the hall was the Special Exhibit of guest artist Canadian Master Carver Fred Zavadil and his exquisite carved creations. Every exhibitor’s table display also showcased the high quality of creative art both in woodcarvings and woodworking projects. Visitors, as well as fellow participating exhibitors, were in awe at the beauty, creativity, and artistry on exhibit throughout the show. The competition of 68 woodworking entries and 254 woodcarving entries was a further exclamation point on the evaluation of superb and creative interpretations of art in wood. It can’t get any better, but then it does every year to the delight of all who experience Artistry in Wood. Highlights included the Children’s Workshop where 120 project kits made by the Western Ohio Woodworkers were put together by the children who came to the show. The smiles on the children’s faces radiated the pride of accomplishment as each carried their completed project. Woodcarving Illustrated and Fox Chapel Publishing hosted demonstrations on both days of the show where the standing room only crowds heard experts Tom Hindes, Jeff Volimer, Mike Allen, Floyd Rhadigan, Wayne Barton, Jim Hiser, and Scott Phillips share their talents. Additional highlights included the Saturday night Banquet with 140 exhibitors enjoying a great banquet meal, relaxing conversations at each table and all went home with a very nice prize. Additionally, visitors enjoyed the Silent Auction and Raffles, Ornament Carving Competition, Magazine recycle table, opportunity to purchase needed supplies from the well-stocked vendors’ displays and most importantly being able to meet and visit with wood artists. 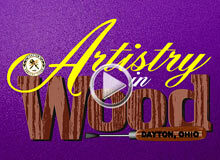 The Dayton Artistry in Wood Show takes great pride in planning and providing for the best show possible each year both for the exhibitors to show and sell their art and vendors’ wares and for visitors to experience an awe-inspiring show. But even more than having a good show, the best part is being able to donate $5000 to United Rehabilitation Services and $750 to Partners Against Crime as the charities of choice each year total donations of $152,000.00. Roberts Centre, located at Exit 50 of Interstate 71 and state route 68, provides plenty of free parking, food concessions during both days of the show as well as restaurant Max and Erma on site along with the Holiday Inn available for lodging. Please accept the invitation to attend the 2019 CELEBRATION AND REUNION SHOW October 12 and 13 at the Roberts Centre, Wilmington, OH.